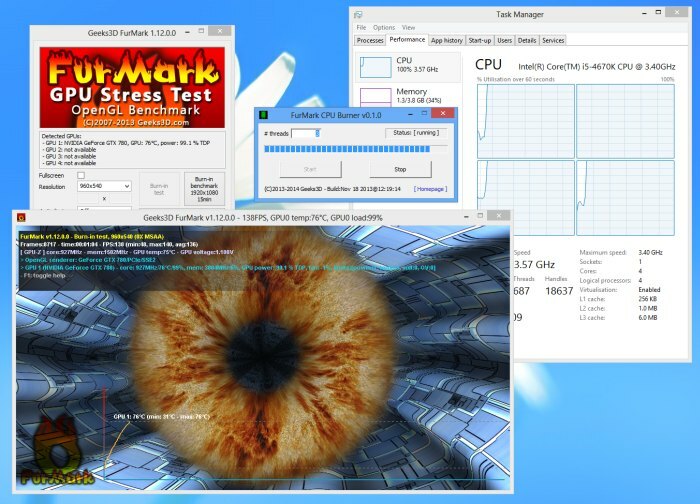 A new version of FurMark, the popular GPU stress test and graphics cards nightmare, is available. FurMark 1.12.0 comes with the support of latest NVIDIA cards (GeForce GTX 780 Ti, Quadro Kxxx) and AMD Radeon R9/R7 series. GPU monitoring tools have been updated to their latest versions (GPU Shark 0.7.5 and GPU-Z 0.7.4). A new utility has been added: CPU Burner. This tiny tool allows to load all available CPU cores with a constant work. Just select the number of threads and launch the CPU stress test. Have encountered a little problem with furmark wich i did’nt had in furmark 1.11.0: when posFX is enabled, the gpu monitoring bar and display stats are dissapearing/reappearing and flickering. Not sure if this is a bug or if it’s just my pc acting up silly.